Network quality key to internet availability in flourishing expedition cruise market as new and innovative itineraries take guests to remote and untouched destinations. Oslo/Paris, April 3, 2019: Ahead of Seatrade Cruise Global in Miami next week, Marlink (booth #2108) reports that the expedition cruise market is in full-on growth mode in terms of demand for connectivity in the most remote corners of the planet. As a leading global satellite service provider and communications partner of choice for luxury and adventure cruise ships and fleets, Marlink says that it is today contracting twice the satellite capacity specifically for the expedition sector as it was just 12 months ago and is now regularly providing megabit connectivity on a truly global scale. Marlink customers in the sector include Hapag-Lloyd Cruises as well as French luxury cruise specialist PONANT. 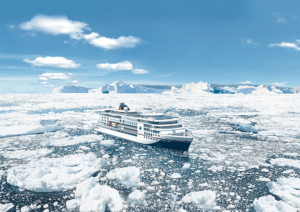 The 100% increase in capacity required to keep guests, crew and company connected as far afield as the Arctic and Antarctic is due to the surge in popularity of expedition cruising. Innovative cruise lines are developing more specialised ships to meet the needs of guests seeking unique cruising experiences which are further afield and off the beaten track. More luxury and exclusivity as well as ensuring that all conveniences are available regardless of location, including connectivity for business and pleasure, are all high on the agenda. Marlink customers in the sector include Hapag-Lloyd Cruises fleet which is operating in remote locations using Marlink VSAT. New ‘expedition class’ ships, HANSEATIC nature and HANSEATIC inspiration, due to be delivered this year and HANSEATIC due in 2021, will have the same high-level connectivity for guests and crew. 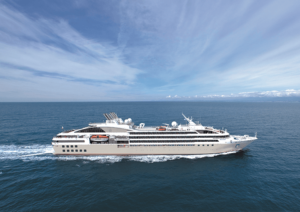 Marlink also renewed its contract to deliver multi-band services to French luxury cruise specialist PONANT late in 2017, a deal that included provision for four new PONANT Explorers yachts – Le Champlain and Le Laperouse, which joined the fleet in 2018, and Le Bougainville and Le Dumont-d’Urville, which will enter service in 2019. Network quality is key to meeting the demanding requirements of expedition cruising and while Marlink deploys state-of-the-art on-board systems and makes capacity available globally, it also focuses development efforts on ensuring that customers have improved support tools to optimise their communication services. In parallel, Marlink is also committed to ensuring its clients can minimise the risk of cyber-attack through inherent security at the network level and the fully integrated ship and shore-based Cyber Guard portfolio, offering harmonised solutions for detection, protection and recovery. With the cruise market in focus, the company recently introduced several new capabilities that can be accessed via an online portal, including an onboard internet Wi-Fi landing site or captive portal with capabilities to connect APIs to the clients own customised cruise management systems for more automated processes, to reduce manual labour. The new support tool also features a dashboard which provides information on best line of sight between the vessel and available satellites, which is especially relevant close to the poles with low elevation where obstructions such as icebergs or cliffs could affect link availability, and therefore the quality of service that guests experience.